My guess date (Hypnobabies word for due date) was May 17th; however, I always had this gut feeling that I would go beyond my guess date. I got excited when I lost my mucus plug while on a field trip with my first-grade students at the zoo, but it was a long week of waiting and trusting that my baby knew when she was ready. On the night of the 18th, I woke up and couldn’t fall back asleep, I had a feeling that my birthing time (Hypnobabies word for labor) was here. Around 2 am I felt my first birthing waves (Hypnobabies word for contractions) that I was certain were leading to my birthing time (finally)! They were frequent and regular from the beginning about every 10 minutes. 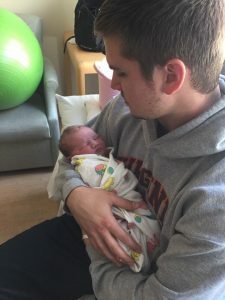 Although I wanted to birth at home as long as possible, I wanted to make sure care for my toddler was covered and that I actually made it to the hospital on time. 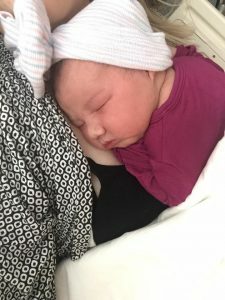 My first hypno-baby was a quick 8 hours and I anticipated this being a quick birthing time as well. We called my sister over and made it to the hospital around 5 a.m.
bulging and that was the pressure I was feeling with each wave. For the next hour I continued birthing although my waves were really close together and intense. I was looking for signs of transformation (Hypnobabies word for transition) that I had felt with my first (nausea, shaking) and I wasn’t feeling anything other than intense pressure. I was feeling discouraged, although I tried to remind myself that a mood change was part of transformation so maybe I was closer than I thought. After an hour of intense waves my husband and I decided to have the midwife artificially rupture my water to see if I could get some relief from the intensity as I was ready to quit. As I laid on the bed and prepared to have my water broken, I felt a sudden gush and a release of pressure. My waters had finally broken, I guess they just needed some encouragement! Almost immediately after I had strong urges to push. I really wanted to birth on all fours, but I was still laid back from preparing to have my waters broken. I tried to tell my husband to switch the track to Pushing Baby Out (Hypnobabies track just for pushing), but our little girl was too eager and couldn’t wait. Within a few pushes my little girl was here! 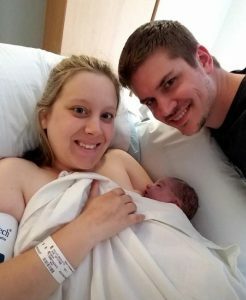 This was my second Hypnobabies birth, but a very different experience than my first. My first birth had several things that didn’t go as planned and I was really looking forward to this birth as a chance to experience peaceful childbirth. Even though my birthing waves were more powerful and intense than I imagined I still felt like I was in control and comfortable. I am so thankful for the Hypnobabies program that gave me the birth that I was hoping for. All the nurses and midwives that we dealt with during our hospital stay were very interested in Hypnobabies and asked lots of questions. Here’s hoping more mommies use this program and get the peaceful comfortable childbirth that we deserve to have!